A few months back when I made a quick stop to see Chris over at Quality Inn Beer Store in Winnipeg, he showed me a list of beers he was getting for the store, and the list was substantial and overwhelming to say the least. A few breweries popped out on that list, the main being The Bruery out of California. Their beer has never been available in Manitoba before, and the only other times I've had their beer was at Brasserie Dunham's Foudres Unis, and once when I picked up a bottle while in Calgary. 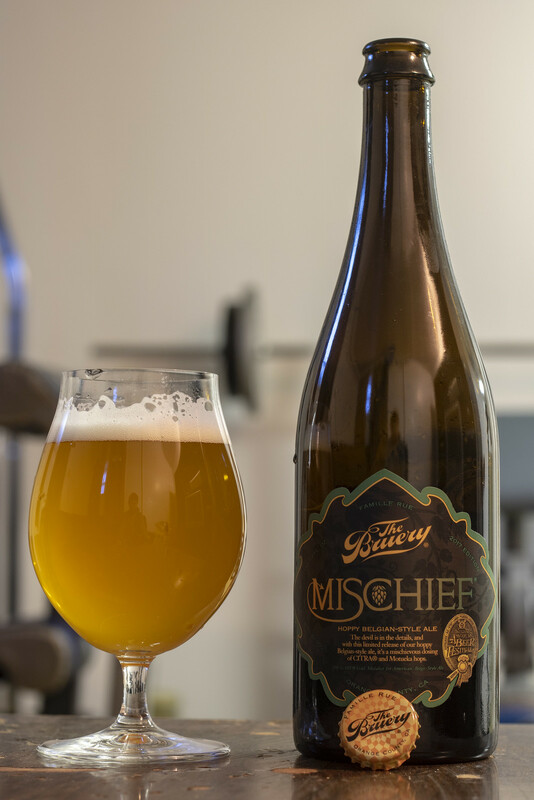 The Bruery's Mischief is described as a hoppy Belgian-style golden ale. This wickedly good golden ale is fiendishly dry-hopped with American hops to add a layer of complexity and mystery to its fruity, dry Belgian-style character. Citrus and resin diabolically combine with ripe melon, pear and slight peppery spice in a precariously effervescent mixture. Enjoy it, but you’ll want to keep an eye out. Gold Medal – 2016 Great American Beer Festival, American-Belgo-Style Ale. Appearance: Pours a cloudy lemon yellow in body with a very light amount of carbonation. The head starts off with a moderate amount of white foam that gradually diminishes to mostly a sprinkling of foam on the top of the beer and a bit of lacing on the side. Aroma: Before I even opened this, I thought "knowing Bruery, this will likely be quite sour, right?" It does have a moderate amount of sourness to it but it's nowhere near as in your face as their Terreux Saison Rue that I reviewed several months back. The aroma is a bit of a sour lemon presence, a bit of grassiness, a hint of peach, a light amount of saltiness that reminds me of a gose to an extent. Is this hoppy like the label states? Yeah, it is I guess - I get the grassy hop presence right at the beginning, but I also get a bit of a Sorachi Ace-like dill/vegetal kind of aroma to it, a light amount of caramel malt sweetness, honey and banana. The aroma keeps changing in every sniff I take, so far.. so good! Taste: The hops are what are popping up most this time around - it's a medley of a bunch of different kinds of hops, I get a bit of a piney bite that I know and love from Cascade hop, there's a bit of a grassy presence to it, good amount of floral/leafiness to it, and a light amount of spiciness that tickles the back of my throat. When I was checking out the aroma, I was thinking the beer was too over the top to be a Belgian-style Golden Ale but every sip I'm having now, it has that distinct Belgian Golden taste to it - it's dry, sweet with notes of honey and pear to it, a light amount of fizzing on the palate, very easy to drink and has a bit of a honey/grassy hop aftertaste to it. This reminds me a bit of a lighter version of Duvel with a good amount of hop presence to it.